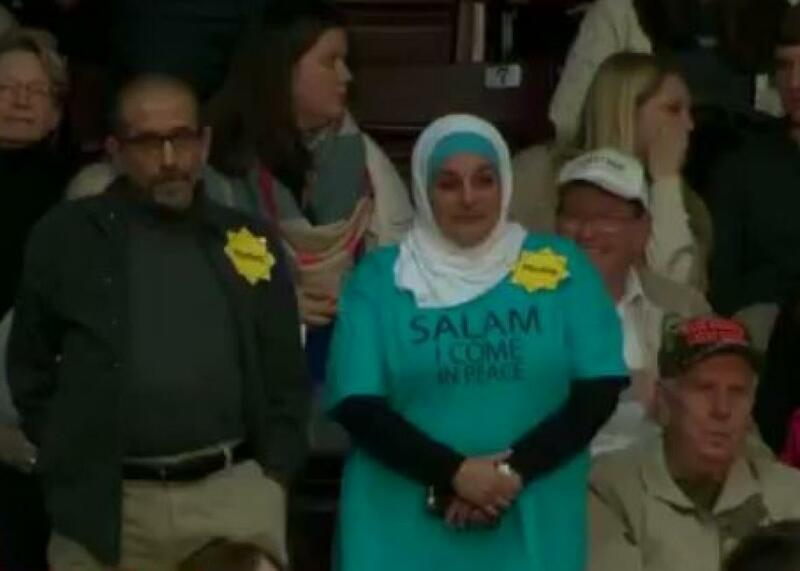 Muslim woman wearing hijab kicked out of Trump rally for protesting silently. A screengrab of CNN video showing the moment when Rose Hamid and Marty Rosenbluth stood up silently during a Donald Trump rally in Rock Hill, South Carolina on Jan. 8, 2016. Protests and interruptions are common fare at Donald Trump rallies. But you apparently don’t have to interrupt the Republican candidate or yell in order to get kicked out. For one Muslim woman, simply standing up was enough to warrant an eviction. It all happened Friday night at a rally in South Carolina. Just as Trump was cautioning against accepting Syrian refugees because they “probably are ISIS,” a 56-year-old Muslim woman wearing a hijab stood up in silent protest. Around her, people immediately began chanting the real estate mogul’s name, which is what the campaign has instructed supporters to do when there are protests. Police officers quickly escorted the flight attendant who was wearing a T-shirt that read, “Salam, I come in peace” out of the arena. As she was getting kicked out, Trump supporters became aggressive, telling her to “get out.” Hamid told CNN that one person even shouted: “You have a bomb, you have a bomb.” Before she stood up, Hamid said that the people around her were rather friendly.